Division of Urology, University of South Florida, Tampa, Florida, U.S.A.
Department of Urology, University of California Davis School of Medicine, Sacramento, California, U.S.A.
Urologists once only peered into the "new frontier" of laparoscopy. Today we are now embracing it and thriving within it, bringing its benefits to our patients. Even as we witness its growth and realize its potential, it is instructive to peer into the past. At the time of this writing, interest in laparoscopic urology continues to rise at an unprecedented rate. This interest is currently evident in both urologic practice and training. The wide range and availability of information has led the patient population to demand laparoscopic knowledge and skills from the urologic community. Thus, residency programs are increasingly emphasizing laparoscopic training, and graduates should have enhanced familiarity with laparoscopic technique once delegated to specialty training. Laparoscopic fellowship programs continue to thrive, producing tomorrow's academic leaders. Courses in advanced laparoscopic urology are available both nationally and internationally for established urologists. unnatural act and there is no evidence that Bozzini had used the instrument again. Although the instrument would have proven cumbersome, inefficient, and painful for both the operator and the patient, it is considered the first major foray into endoscopy. The original Lichtleiter of Bozzini is now enshrined in the Josephinum in Vienna (2). Throughout the mid 1800s, several scientists attempted to construct endoscope-like instruments. Pierre Segalas from France refined the urethroscope in 1826 adding an introduction cannula and mirrors for light reflection. Antonin Desormeaux, Segalas' fellow countryman, presented the first serviceable endoscope to the Academy of Paris in 1853 (Fig. 3) (1,3). He performed and reported several investigations of the urethra and bladder using such instrument, of which major development consisted of an illumination source of increased intensity obtained utilizing the reflected light from an alcohol lamp. A clear intellectual milestone had been reached, and Desormeaux was awarded a portion of the Argenteuil Prize for such an achievement (4). The development of a light source that could be transported into the body cavity was the next, awaited major innovation. Using a platinum wire loop heated by an electric current, Julius Bruck, a dentist of Breslau, heralded the development of internal illumination in 1867 (5). Despite great success in the exploration of the oral cavity, Bruck's technique of water-cooled, diaphanoscopic bladder transillumination by a rectally placed coil was still dangerous, and rather ineffective. Apparently unaware of Bruck's earlier attempts, Max Nitze from Germany successfully applied this kind of illumination source to his cystoscope in the late 1800s (Fig. 4). Compelled by the concept of an internal light source, Nitze succinctly stated: "in order to light up a room, one must carry a lamp into it" (5). Applying these concepts, Nitze and Diecke, an instrument maker in Dresden, were able to manufacture their first cystoscope in 1877 (6). This instrument was still rather bulky and unreliable. Teaming up with Joseph Leiter, a renowned instrument maker in Vienna, Nitze developed the necessary further improvements consisting of an electrically-heated platinum wire light source placed behind a quartz shield. The Nitze-Leiter cystoscope was presented in 1879 (Fig. 5). Despite these advances, the heat generated within the bladder required a bulky water-cooling device, and the electrical apparatus that created the necessary current for the platinum wire was difficult to maintain (Fig. 6). Further progress awaited Thomas Edison's invention of the incandescent lamp in 1880. This landmark development provided increased illumination and alleviated the need for the water-cooling system. A larger part of the scope could be dedicated to the optical lens system, resulting in better visualization with improved light delivery (1). Multiple endoscopists, including David Newman (1883), Nitze (1887), Leiter (1887), and Dittel (1887) employed the incandescent bulb (6). FIGURE3 ■ Desormeaux's endoscope (ca. 1853). FIGURE5 ■ The Nitze-Leiter cytoscope (ca. 1879). FIGURE 6 ■ An early cytoscope. FIGURE 7 ■ Light source developed by preston in 1898 for the mignon lamp. FIGURE9 ■ Hans Christian Jacobaeus. technical refinements he developed. 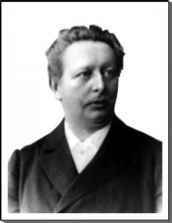 Hans Christian Jacobaeus of Sweden (an internist in Stockholm) published on both human laparoscopy and thoracoscopy in 1910, highlighting the low morbidity of such procedure despite the use of a single trocar to both produce the pneumoperitoneum and provide endoscopic access (Fig. 9) (13). By 1912, his reported series included a total of 115 patients (13—16). At Johns Hopkins University in 1911, Bernheim performed an organoscopy using a proctoscope to visually inspect the peritoneal cavity (Fig. 10) (17). Minor variations in equipment and technique were described in subsequent reports from both Europe and the United States (18). 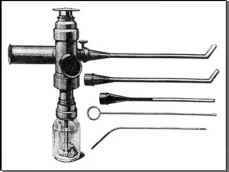 In 1920, Orndoff devised a trocar with a pyramidal point and an automatic cannula valve to prevent the escape of gas from the pneumoperitoneum (19). He published his experience with laparoscopy performed using such devices and a roentgen screen. To prevent the leakage of gas, Stone from the United States described the fitting of the outer portion of the trocar with a rubber gasket in 1924 (20). At the same time, Zollikofer from Switzerland introduced the use of CO2 for insufflation and observed its ease of absorption (21). The primary medium was previously filtered air, with its intrinsic risk of air embolism. To minimize the risks related to initial abdominal puncture, Goetze from Germany developed an automatic insufflation needle in 1918 (22). Initially, the insufflating medium for this instrument was oxygen, a gas with lower incidence emboli formation when compared to air. However, it soon became obsolete with the advent of electrocautery. In 1938, Veress from Hungary further refined the automatic needle initially used for the creation of pneumothorax in the treatment of tuberculosis (Fig. 11) (23). The Veress needle is now routinely used to create pneumoperitoneum. FIGURE ll ■ Vepress's automatic needle (ca. 1938). FIGURE 12 ■ H. Kalk. FIGURE 13 ■ Kurt Semm. was a considerable task, given the limited ability to convey the otherwise "closed" world of laparoscopy. Although multiple devices had been designed for photographing laparoscopic detail, the majority of description was by illustration alone. These limitations continued until a single lens reflex camera for endophotography was introduced by Henning in 1931 (27). The first black and white and color photographic atlas was published by Kalk in 1935 (27). Later on Caroli, Ricordeau, and Foures from France first used an electronic flash intra-abdominally (28). Further major advances in visual reproduction awaited the development of improved light transmission, lens systems, cinephotography, and eventual video technology. Meanwhile, laparoscopy made its initial forays into the interventional realm. Due to advances and modifications in high frequency unipolar electrocautery, in 1933, Fervers from Germany burned abdominal adhesions and performed excisional biopsy (29). 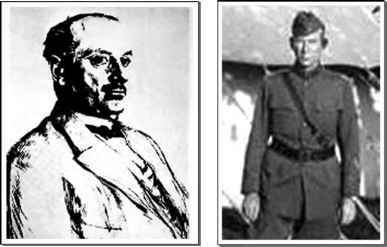 In the United States, Ruddock further perfected his own peritoneoscope, pneumoperitoneum needle, trocar, and ancillary instruments for biopsy (30-34). He published his initial series of 200 cases in 1934, followed by his entire experience with more than 2500 cases. Laparoscopic tubal sterilization using electrocautery was first described in the porcine model by the Swiss Boesch in 1935 (35). Power and Barnes from the United States performed this on a patient in 1941; their report included an interim published discussion of the technique by Anderson (36,37). The American Donaldson used the Ruddock peritoneoscope to perform a uterine suspension in 1942 (38). Further progress in laparoscopic abdominal surgery had to await the better provisions for safe hemostasis achieved by improved electrocautery. During World War II, culdoscopy, as described by Albert Decker in 1944, gained the attention of the American surgical community and became a standard gynecologic procedure in the United States for many years (39-41). Contemporarily, the French Raoul Palmer greatly furthered gynecologic laparoscopy throughout Europe (9,42). Interest was not rekindled in the United States until the publication, in 1967, of the first English laparoscopic textbook by the British gynecologist Steptoe, who was influenced by his European colleagues (43). The resurrection of American laparoscopy occurred through the dissemination of contemporary experience and by the accompanying advances in optics, light transmission, insufflators, and ancillary materials. These largely European developments broadened the field's utility and better ensured patient safety. In 1952, the French Fourestier, Gladu, and Valmiere developed a method for light transmission along a quartz rod that greatly improved the quality of light produced, and removed the risk of electrical and heat injury plaguing previous systems (44). The same year Hopkins and Kapany from England first employed fiber optics similar to those used into the fiber optic gastroscope (45). Hopkins was also developed a quartz rod lens, which replaced prior lens systems of rigid endoscopes (46). Frangenheim incorporated many of these advances in laparoscopy, using diathermy for tubal sterilization in 1963, and fiber optics in 1965 (46). His extensive publications regarding anesthetic methods, pneumoperitoneum, tissue emphysema, air embolism, intestinal perforation, hemorrhage, burns, and cardiopulmonary problems furthered the course of safe laparoscopic procedure (47). In the United States, Cohen, followed by Hulka, were at the forefront of laparoscopy through the late 1960s and early 1970s, disseminating and popularizing laparoscopy within the gynecologic community (47,48). After initially diagnostic application, the major indication was voluntary sterilization. These methods were so widespread, that Jordan M. Phillips founded the American Association of Gynecologic Laparoscopists in 1972 (48). Its second annual meeting was held in 1973 in conjunction with the First International Congress of Gynecologic Laparoscopy, and counted 600 attendees. At that time, approximately 500,000 laparoscopic procedures were performed annually in the United States, and laparoscopy became a requirement of residency training in obstetrics-gynecology programs by 1981 (48). 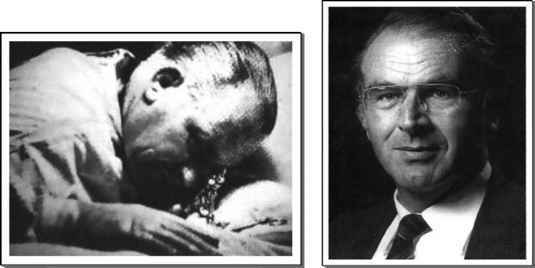 Meanwhile, substantial pioneering work by Kurt Semm advanced the safety and scope of laparoscopy (4,35,49-53). Automatic control systems were developed for induction and maintenance of the pneumoperitoneum using CO2. Through the 1970s, further Semm's work in conjunction with WISAP (Sauerlach, West Germany) led to the development of electronically controlled units. The development of the open trocar technique of Hasson expanded the indications for laparoscopy including patients with a history of prior laparotomy and adhesions, considered a contraindication to laparoscopy so far (46,54). Semm takes great note regarding the lack of safe hemostasis as additional impediment in the advancement of laparoscopic surgery (35). The use of high frequency monopolar cautery within the abdominal cavity had been historically fraught with the serious sequelae of bowel injury. Indeed, the second most frequent cause for lawsuits against obstetrician-gynecologists in the early 1970s was for laparoscopic bowel burns (7). Therefore, a great deal of investigation was devoted to eliminate these dangers, particularly, with the growing popularity of laparoscopic tubal disruption. The electrical shielding of instruments and current reduction were introduced to obviate these problems, along with the subsequent development of the 100°C endocoagulator. Hemostatic methods also included the use of "endoloop" and suturing devices for large blood vessel control (4,50,53). Laparoscopy, initially performed to diagnose liver and gallbladder diseases, was employed progressively less frequently as radiographic imaging developed and moved to the forefront. After performing the first laparoscopic cholecystectomy in Germany in 1985, Muhe suffered the indignities of collegial criticism and ostracism like Semm did before after performing the first laparoscopic appendicectomy. In 1987, Philippe Mouret, a French gynecologist, performed laparoscopic cholecystectomy during a routine pelvic procedure (45), and presented his experience during a meeting. The first clinical series of laparoscopic cholecystectomy were performed by Francois Dubois in France in 1988, and McKernan and Saye (1988) and Reddick (1989) in the United States (45,55). Reddick's and Dubois' documented the capability of laparoscopic cholecystectomy to duplicate open surgical principles (56). Based on these pioneering experiences, interest on laparoscopic cholecystectomy raised tremendously resulting in rapid widespread of the procedure to the point of almost replacing elective open cholecystectomy in many centers over a three-year period (45). While this may be startling when viewed as an isolated event, it is predictable when perceived within a broader framework. The performance of complex intra-corporeal procedures in a safe and reliable manner required more than the simple development of advanced mechanical instrumentation. It was also the result of the coordinate efforts of many operators. During standard laparoscopic practice, only the primary could actually see the operative field, while the ability of the assistant to substantially participate was limited blind involvement. Additional eyepiece attachments were incorporated for learning purposes to allow the novice to gain the necessary skills to subsequently operate alone. Although closed circuit television was manufactured since 1959, portable systems were not available until 1970 (48). The term "portable" should be applied sparingly, because the initial cameras weighed some 10 pounds and were equipped with an attachable ceiling harness. Their size, image quality, and cost relegated them to the rare and cumbersome teaching aid. Only the advent of microchip technology allowed practical real-time video monitoring of the operative field. Widespread and extensive use of such technology throughout all areas of endoscopy marked the groundwork for major laparoscopic intervention. With the entire surgical team watching at the surgical field, more complex procedures could be undertaken. Laparoscopy in urology paralleled, to a large extent, the changes in general surgery. Up to the late 1980s, urologic laparoscopy had limited applications. In 1976, Cortesi reported laparoscopic abdominal exploration in an 18-year old patient with bilateral abdominal testes (57). Since then, cumulative experience by multiple authors has substantiated laparoscopic management of cryptorchidism (58-61). Another anecdotal application was reported by Wickham, who, in 1979, performed laparoscopic ureterolithotomy by a retroperitoneal approach (62). Additional stone manipulation was performed by Eshghi, who, in 1985, laparo-scopically monitored the percutaneous transperitoneal removal of staghorn calculi from a pelvic kidney (63). However, apart from its use in the pediatric population for cryptorchidism, uro-logic laparoscopy lacked a broad application when compared to the large population of patients with cholelithiasis treated laparoscopically by general surgeons. In fact, in many urologic procedures the benefits of laparoscopy were initially outweighed by the technically challenging anatomy that greatly limited access and compromised control. Varicocelectomy and bladder neck suspension were deemed feasible but showed little benefit over open surgery. Laparoscopic pelvic lymphadenectomy performed to overtake inaccuracy of imaging techniques for staging of patients with prostate carcinoma was deemed both feasible and effective (64). Laparoscopic pelvic lymphadenectomy in a porcine model was described by Howard Winfield in 1989 (65). Schuessler and associates first performed this procedure in a series of patients with prostate cancer. Nevertheless, interest in laparoscopic pelvic lymph node dissection dropped precipitously in mid 1990s due to advances in nonoperative staging of prostate cancer. After initial, isolated but encouraging reports, Janetschek et al. performed laparoscopic retroperitoneal lymph node dissection in an attempt to reduce the morbidity of open retroperitoneal lymph node dissection (66). Kavoussi and coworkers reported the feasibility of laparoscopic retroperitoneal lymph node dissection for patients with stage I non-seminomatous germ cell tumors. Efficacy was similar to traditional retroperitoneal lymph node dissection (67). Renal procedures are the main target for urologic laparoscopic organ resection. Laparoscopic nephrectomy in a porcine model was first attempted via a retroperitoneal approach by Weinberg and Smith in 1988 (68). In 1991, after extensive laboratory trials including the development of the basic concepts of organ entrapment and tissue morcel-lation, Clayman and coworkers performed the first clinical laparoscopic nephrectomy. Subsequent continued results of transperitoneal laparoscopic nephrectomy have been reported by the same group (69-71). With increasing skills and experience, the total operative time of almost eight hours required to complete the initial case was reduced to four hours. Such procedures heralded a new era in laparoscopic urology that began to challenge and compete with conventional open surgery. However, many technical refinements were necessary to make laparoscopy an appealing alternative to open surgery. Using retroperitoneal balloon dissection to create an adequate retroperi-toneal space, Gaur obviated the initial difficulties with closed insufflation of the retroperitoneum (72). In addition to these advances, significant improvements in vascular control and soft tissue hemostasis are constantly evolving. As a result, more challenging laparoscopic renal procedures were progressively attempted and executed. Winfield and colleagues performed the first laparoscopic partial nephrectomy in 1993. Subsequent series of laparoscopic partial nephrectomy reported by many authors showed cancer control similar to open nephron-sparing procedures. Capitalizing on the relatively benign recovery from laparoscopic surgery, in 1994, Gill et al. demonstrated the feasibility of laparoscopic donor nephrectomy in the porcine model (73). The first clinical donor nephrectomy performed by Kavoussi and coworkers in 1995 (74). Over the next five years, the technique became more refined, and it has since spread worldwide. At many centers, laparoscopic donor nephrectomy is the now standard of care. The development of a handport providing direct hand assistance has increased accessibility to renal surgery. The ability to manipulate tissue has greatly increased the comfort zone for many urologists, broadening the indications for minimally invasive procedures. One of the critiques raised by laparoscopic purists regards the size of the incision required to place the handport. Undoubtedly, handassisted laparoscopy provides greater control and easier organ retrieval for the naive laparoscopic surgeon. The next urologic milestone in laparoscopic organ resection was the management of prostate and bladder diseases. Laparoscopic radical prostatectomy was innovated and perfected in Paris by Guillonneau and Vallancien (2000) (75) as well as by Abbou et al. (2000) (76). Although a steep learning curve was necessary to perform Laparoscopic radical prostatectomy in a time-sensitive manner, today several centers worldwide perform laparoscopic radical prostatectomies routinely with results similar to those of the open counterpart. Improved magnification and better identification of the anatomical structures are potential benefits, and decreased morbidity is anticipated. However, at the time of this writing, open prostatectomy remains the standard of care. Nevertheless, laparoscopic technology and experience on Laparoscopic radical prostatectomy, and their acceptance, continue to evolve. Laparoscopy has been applied also to the technically demanding area of cystec-tomy. In 2000, Gill et al. reported their initial experience with bilateral pelvic lymphadenectomy, cystectomy, and ileal conduit urinary diversion in patients with muscle-invasive bladder cancer (77). The ability to complete this procedure intracorpo-really required a high level of reconstruction that has also been applied to other areas in urology. The same laparoscopic techniques for suturing and knot tying were efficaciously employed to perform, ureteral reimplantation, ureteroureterostomy, and pyeloplasty. In fact, in select centers laparoscopic pyeloplasty is becoming the standard of care for ureteropelvic junction obstruction. 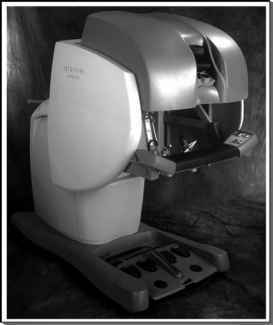 The development of robot technology (da Vinci® Surgical Systema) is the epitome of surgical magnification and technical refinement (Fig. 14). Such expensive sophistication allows for intricate manipulation within a limited operative space. It is becoming increasingly evident that laparoscopy has the potential to duplicate the principles of open urologic surgery for the management of several medical conditions involving the lymph nodes, kidney, adrenal gland, bladder, or ureter. However, although technical pioneers have demonstrated the feasibility of many demanding laparoscopic procedures, long-term results are awaited before these procedures would become routinely part of the urologic armamentarium. In order for evolution to occur and to continue, nuances must prove to be superior to the status quo. The hallmark of this current period of urologic laparoscopic history is the combination of technical achievement demonstrating what can be done, with the application of academic rigor to determine what should be done. In an increasing number of multi-institutional studies, laparoscopic procedures are compared with their open surgical counterparts. The evidence of comparable efficacy combined with improvements in postoperative pain, cosmesis, recovery, and length of hospital stay shows that laparoscopy belongs in the mainstream of urologic surgery. FIGURE 14 ■ The da Vinci® Surgical System. Source: Courtesy of Intuitive Surgical, Inc.
aIntuitive Surgical, Inc., Sunnyvale, CA. In this current era, feasibility and benefit of many urologic laparoscopic procedures have been proven on a large scale. As we enter the new millennium, the craft of open surgery may have an ever-decreasing role in the treatment of urologic diseases. This evolution will require the demonstration of benefit over existing standard practice, which then must be embraced by urology in order to be implemented. This evolution, initially charted by the relentless pioneers mentioned in this chapter along with countless others, will continue to be written as an odyssey of innovations in the hands of modern stalwarts. 1. Herman J. Development of the cystoscope. In: Urology: A View Through the Retrospectroscope. Hagerstown: Harper and Row, 1973:67. 2. 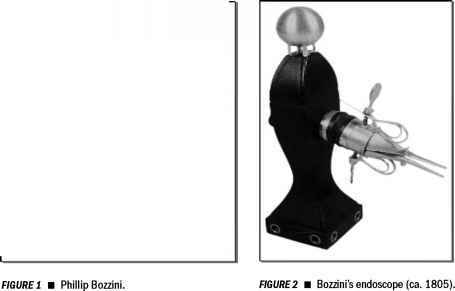 Engel RM, Philipp Bozzini-the father of endoscopy. J Endourol 2003; 17(10):859-862. 3. Desormeaux A. Transactions of the Societe de Chirurgie, Paris. Gazette des Hop, 1865. 4. Semm K. Endoscopic intraabdominal surgery in gynecology. Wiener Klinische Wochenschrift 1983(May 27); 95(11):353-367. 5. Luys, G.H.o.c.I.A.T.o.C.a. History of Cystoscopy. A Treatise on Cystoscopy and Urethroscopy (trans). St. Louis: C.V. Mosby, 1918:55. 6. Belt, A.a.C., DA:. In: Cabot H, ed. 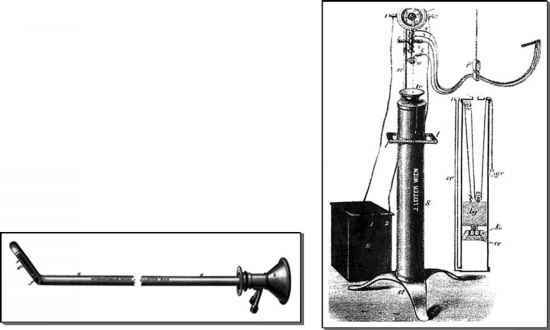 The History of the Cystoscope In Modern Urology. Philadelphia: Lea & Fibiger, 1936:15. 7. Hulka J. History and Introduction. Textbook of Laparoscopy. Orlando: Grune & Stratton, 1985:1-5. 8. Ott D. Ventroscopic illumination of the abdominal cavity in pregnancy. Zhurnal Akusherstva I Zhenskikh Boleznei 1901; 15:7-8. 9. Palmer, R.L.C.p.l.v.t.C.R.S.F. La Coelioscopie par la vois transvaginale. CR Soc Franc Gynec 1947; 17:229. 10. Wittman I. Peritoneoscopy. Budapest: Publishing House of the Hungarian Academy of Sciences, 1966:3-5. 11. Litynski GS. Highlights in the History of Laparoscopy. Frankfurt, Germany: Barbara Bernert Verlag, 1996:367. 12. Kelling GM. Ueber oesophagoskopie, Gastroskopie und Koelioskopie. Med Wochenschr 1902; 49:21. 13. Jacobaeus HC. Über die möglichkeit die zystoskopie bei untersuchung seröser höhlen anzuwenden. Munch Med Wochenschr 1910; 57:2090-2092. 14. Jacobaeus HM. Kurze Ubersicht uber mei erfahrungen mit der laparo-thorakoskopie. Med Wschr 1911; 58:2017. 15. Jacobaeus H. Laparo-thorakoskopie. Hygiea (Stockholm) 1912; 74:1070. 16. Jacobeaus H. Uber laparo- und thorakokopie. Beitr Klin Tuberk 1912; 25:183. 17. Bernheim BM. Organoscopy: cystoscopy of the abdominal cavity. Ann Surg 1911; 53:764-767. 18. Nadeu, O.a.K., OF. Endoscopy of the abdomen: abdominoscopy. A preliminary study, including a summary of the literature and a description of the technique. Surg Gynec 1925; 41:259. 19. Orndoff R. The peritoneoscope in diagnosis of diseases of the abdomen. J Radiol 1920; 1:307. 20. Stone Z. Intra-abdominal examination with the aid of the peritoneoscope. J Kans Med Soc 1924; 24:63. 21. Zollikofer R. Zur laparoskopie. Schweiz Med Wschr 1924; 54(264). 22. Goetze O. Die rontgendiagnostik bei gasgefullter bauchhohle; eine neue methode. Med Wschr 1918; 65:1275. 23. Veress J. Neues Instrument zue Aufuhrung von Brust Oder Bauchpunktionen. Dt Med Wschr 1938; 41:1480-1481. 24. Kalk H. Erfahrungen mit der laparoskopie (Zugleich mit beschreibung eines neuen instumentes). Z Klin Med 1929; 111:303. 25. Kalk H. Laparoskopie (Die besichtigung der bauchhohle am lebenden Menschen). Ges Krankenh 1935; 5:97. 26. Kalk HB., W; and Sieke, E. Die gezielte leberpunktion. Dtsch Medl Wschr 1943; 69:693. 27. Saleh, J.I.a.l.I.L. Laparoscopy: Indications and Limitations. Philadelphia: W.B. Saunders, 1988:1. 28. Caroli J. La Laparophotographie en couleurs par l'endographe de Foures. Rev Int Med 1955; 5:951. 29. Fervers C. Die Laparoskopie mit dem Cystoskop. Ein Beitrag zur Vereinfachung der Technik und zur Endoskopischen Strangdurchtrennung in der Bauchhohle. Med Klin 1933; 29:1042. 30. Ruddock, J.A.a.e.o.p.C.M. Application and evaluation of peritoneoscopy. Calif Med 71:110. 31. Ruddock J. Peritoneoscopy. Surg., 1939; 8:113. 32. Ruddock J. Peritoneoscopy. Surg Gynec Obstet 1937; 65:637. 33. Ruddock J. Peritoneoscopy. West J Surg 1934; 42:392. 34. Ruddock J. Pertoneoscopy: a critical review. Surg Clin North Am 1957; 37:1249-1260. 35. Semm K. In: Sanfilippo JS, Levine RL, eds. Operative Gynecologic Endoscopy: History. New York: Springer-Verlag, 1989. 36. Anderson E. Peritoneoscopy. Am J Surg 1937; 35:136-139. 37. Power FB, AC. Sterilization by means of peritoneoscopic tubal fulguration. Am J Obstet Gynec 1941; 41:1038. 38. 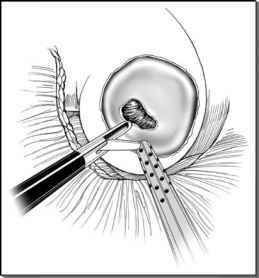 Donaldson J.S., JH; Harrell, WB, Jr. A method of suspending the uterus without open abdominal incision. Am J Surg 1942; 55:537. 39. Decker A. Culdoscopy: its diagnostic value in pelvic disease. JAMA 1949; 140:378. 40. Decker A.C., T. Culdoscopy: a new method in diagnosis of pelvic disease. Am J Surg 1944; 64:40. 41. Decker A. Culdoscopy. Am J Obstet Gynec 1952; 63:654. 42. Palmer, R.L.C.B.-m. La Coelioscopie. Brux.-med 1948; 28:305. 43. Steptoe P. Laparoscopy in Gynaecology. Edinburgh: E&S Livingston Ltd, 1967. 44. Fourestier M, Gladu A, Vulmiere J. Perfectionnements a l'endoscopie medicale. Realization bron-choscopique. Presse Med 1952; 60:1292. 45. Gaskin TI, Isobe JH, Mathews JL, Winchester SB, Smith RJ. Laparoscopy and the general surgeon. Surg Clin North Am 1991; 71(5):1085-1097. 46. Hasson H. Open laparoscopy: a report of 150 cases. J Reprod Med 1974; 12:234-238. 47. Cohen M. Historical background. Laparoscopy, Culdoscopy and Gynecography. Philadelphia: WB Saunders, 1970:6. 48. Gunning J. The history of laparoscopy. In: Phillips JM, ed. Laparoscopy. Baltimore: William & WIlkins Co, 1977. 49. Semm K. Change in the classic gynecologic surgery: review of 3,300 pelviscopies in 1971-1976. Int J Fertil 1979; 24(1):13-20. 50. Semm K. Endoscopic appendectomy. Endoscopy 1983(Mar); 15(2):59-64. 51. Semm K. New methods of pelviscopy (gynecologic laparoscopy) for myomectomy, ovariectomy, tubectomy and adnectomy. Endoscopy 1979; 11(2):85-93. 52. Semm, K.T. Tissue puncher and loop ligation new aids for surgical therapeutic pelviscopy (laparoscopy)—endoscopic intraabdominal surgery. Endoscopy 1978(May); 10(2):119-124. 53. Semm KML. Technical progress in pelvic surgery via operative laparoscopy. Am J Obstet Gynecol 1980(Sep 15); 139(2):121-127. 54. Hasson H. A modified instrument and method for laparoscopy. Am J Obstet Gynecol 1971; 110:886. 55. Reddick EJ, Olsen DO. Laparoscopic laser cholecystectomy: a comparison with minilaparoscopic cholecystectomy. Surg Endosc 1989; 3:131. 56. Dubois F, Icard P, Bertholet G, et al. Coelioscopic cholecystectomy: preliminary report of thirty-six cases. Ann Surg 1990; 211:60. 57. Cortesi NF, Ferrari P, Zambarda E, et al. Diagnosis of bilateral abdominal cryptorchidism by laparoscopy. Endoscopy 1976; 8:33-34. 58. Das SA, Amar AD. The impact of laparoscopy on modern practice. Urol Clin North Am 1988; 15(3):537-540. 59. Duckett J. Laparoscopy for cryptorchidism. Dialogues. Pediatr Urol 1988; 11(7):6. 60. Elder J. Laparoscopy and Fowler-Stephens orchiopexy in the management of the impalpable testis. Urol Clin North Am 1989; 16(2):399-401. 61. Weiss RS, Seashore JH. Laparoscopy in the management of the nonpalpable testis. J Urol 1987; 138:382-384. 62. Wickham J. The surgical treatment of renal lithiasis. Urinary Calculus Disease. New York: Churchill Livingstone, 1979:145-198. 63. Eshghi AR, Roth JS, Smith AD. Percutaneous transperitoneal approach to a pelvic kidney for endourological removal of staghorn calculus. J Urol 1985; 134:525-527. 64. Griffith DS, Schuessler WW, Nickell KG, Meaney JT. Laparoscopic pelvic lymphadenectomy for prostatic adenocarcinoma. Urol Clin N Am 1992; 19(2):407-415. 65. Winfield, H.R., KJ. Laparoscopy—new urological applications. Presented at the American Urological Association 84th Annual Meeting, May 7, 1989. 66. Janetschek G, et al. Laparoscopic retroperitoneal lymph node dissection. Urology 2000; 55(1):136-140. 67. Bhayani SB, Allaf ME, Kavoussi LR. Laparoscopic retroperitoneal lymph node dissection for clinical stage I nonseminomatous germ cell testicular cancer: current status. Urol Oncol 2004; 22(2):145-148. 68. Weinberg JS, Smith AD. Percutaneous resection of the kidney: preliminary report. J Endourol 1988; 2:355. 69. Clayman RV, Kavoussi LR. Laparoscopic Procedures: Nephrectomy: Technique and Results. Presented at The Society for Minimally Invasive Therapy Third International Meeting, Nov 12, 1991. 70. Clayman RV, Kavoussi LR, Soper NJ, et al. Laparoscopic nephrectomy: initial case report. J Urol 1991(Aug); 146(2):278-282. 71. Copcoat, M.J., A; Rassweiler, J; Popert R, Laparoscopic Nephrectomy: The Kings clinical experience. presented at the American Urological Association 87th Annual Meeting. May 13, 1992. 72. Gaur RS, Ravandale AV, Gopichand M. A single-centre experience of retroperitoneoscopy using the balloon technique. BJU Int 2001(May); 87(7):602-606. 73. Gill IS, Ccarbone JM, Clayman RV, et al. Laparoscopic live-donor nephrectomy. J Endourol 1994(Apr); 8(2):143-148. 74. Ratner LE, Ciseck L, Moore RG, Cigarroa FG, Kaufman HS, Kavoussi LR. Laparoscopic live donor nephrectomy. Transplantation. 1995(Nov 15); 60(9):1047-1049. 75. Guillonneau B, Vallencien G. Laparoscopic radical prostatectomy: the Montsouris technique. J Urol 2000; 163:1643-1649. 76. Abbou CC, Salomon L, Hoznek A, et al. Laparoscopic radical prostatectomy: preliminary results. Urology 2000; 55:630-633. 77. Gill IS, Fergany A, Klein EA, et al. Laparoscopic radical cystoprostatectomy with ileal conduit performed completely intracorporeally: the initial 2 cases. Urology 2000(Jul); 56(1):26-29.